Last month was full of friends and explorations for me and when I sat down to really think about it, I realized that I had gone out almost every single night in June. Which is just crazy. In fact, there were only four evenings during June that I spent at home. That’s a meager 13% percent of my evenings. Which makes me thankful. Really, really thankful. I’m thankful that I live in a vibrant, young city where there is an endless supply of activites with which to entertain myself. I’m thankful that I have a massive group of friends who are also looking to make the most of their time outside of work. And I’m thankful for all the truly inspiring people I’ve met through the DC Tech Scene (I can’t believe I just wrote that publically, but, yes, that’s what it’s called and it’s pretty happening, if I might add) who have become my friends. Monday, June 1 – Attended a lecture by Keith Ferrazzi on the subject of his recently published book: Who’s Got Your Back. Read my reflections here. Afterwards, had dinner at Bistro Bis with great company: @_VNL, @bucchere, @dcconcierge, and @jjgardner3. Tuesday, June 2 – Asked my readers: Where do twentysomethings live in DC? Read what they answered and share your thoughts. Hung out at Rumors with @abudman and Mark K. One day I will eat and/or go out to Rumors. Wednesday, June 3 – I believe I spent the evening at home. The first of four such nights in June. 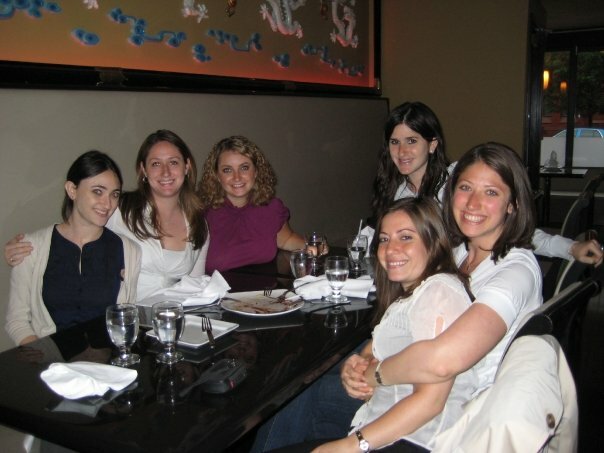 Thursday, June 4 – Celebrated @mindyzeidman‘s birthday at Asian Spice with Laura, Jackie, @anj39, and @abudman. Friday, June 5 – Enjoyed a traditional Shabbat Dinner with @mindyzeidman, Daniel, Laura, Zac, Jackie, Scott, Mark, Ben W, @anj39, @dkatzman54, and @abudman. Saturday, June 6 – Went out to The Park (with five cab-fulls of friends!) for a continuation of @mindyzeidman‘s birthday celebration. Sunday, June 7 – Brunch at Cafe Saint-Ex with @dcconcierge, followed by shopping in the U Street area and a tour of @dcconcierge‘s apartment . We were briefly joined at brunch by @technosailor. Monday, June 8 – I believe I spent the evening at home. The second of four such nights in June. Tuesday, June 9 – Watched the Red Sox / Yankees game at Porter’s with @akmcquade, @sheffi, @lostonroute66, @abudman, Ben W. and @mindyzeidman. Wednesday, June 10 – Watched the Red Sox / Yankees game at Rhino Bar with @justinherman, @chrisderose, and @asomyak. Thursday, June 11 – Attended the pre-conference happy hour for Blog Potomac at Carpool. Friday, June 12 – Attended BlogPotomac. Read what I liveblogged from the conference. Afterwards, I flew to Boston for my sister’s Bat Mitzvah. See pictures from both the Blog Potomac happy hour and the conference itself. Saturday, June 13 – Celebrated my sister’s Bat Mitzvah with my family. Sunday, June 14 – Flew back to DC from Boston and had a late dinner at Clyde’s with @justinherman. Monday, June 15 – Attended happy hour at Big Hunt to send off Aaron. Read my review of Big Hunt. Tuesday, June 16 – Attended Sixth & I Trivia at Capitol Skyline Hotel. Spike Mendelsohn was a guest announcer! 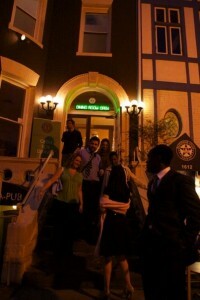 Wednesday, June 17 – Attended the NextGenWeb website relaunch at Darlington House. See pictures from the NextGenWeb relaunch. Thursday, June 18 – I believe I spent the evening at home. The third of four such nights in June. Friday, June 19 – Enjoyed a “girls’ dinner” with @mindyzeidman and @abudman at Sakana. Read my review of Sakana. Saturday, June 20 – Went out to Public Bar. Sunday, June 21– Visited the FDR Memorial with Lauren. Monday, June 22 – Attended happy hour at RFD to send Daniel off on a “find yourself” vacation to Israel. Read my review of RFD. Afterwards, relocated to Sushi Aoi for dinner with Daniel, Sam, Bryan, Eric,@mindyzeidman, @anj39, @dkatzman54, @agrossbe, and @skeevis. Tuesday, June 23 – Attended the Red Sox / Nationals Game with @mindyzeidman. Wednesday, June 24 – Attended the Red Sox / Nationals Game with @justinherman. Thursday, June 25 – Attended the Red Sox / Nationals Game with @dkatzman54. Friday, June 26 – Enjoyed a somewhat non-traditional Shabbat Dinner (take out style!) with @mindyzeidman, Laura, Jackie, Scott, Ben W, @anj39, @dkatzman54, and @abudman. Saturday, June 27 – Tried my hand at whitewater tubing down the Potomac River in West Virginia with 21 of my closest friends. Long story short, went over the rapids without a tube or a life vest. Collected several bruises as souvenirs. Sunday, June 28 – Visited the Newseum with @anj39 and later watched Away We Go with @mindyzeidman. Monday, June 29 – Watched The Hangover with @mindyzeidman, @the_n0mster, and Ben A.
Tuesday, June 30 – I believe I spent the evening at home. The fourth of four such nights in June. On Monday evening, I went to hear Keith Ferrazzi, author of Never Eat Alone, speak about his new book Who’s Got Your Back. A lot of the things he spoke about really resonated with me. His message was that we, as a culture, have become isolated from each other yet it’s relationships that drive both professional and personal success. During the talk, Keith had us do several exercises with the person sitting next to us. In the first exercise, he had us identify an ultimate goal of ours – something that we longed for and fear we might never achieve. Those who know me well know that I ended up sharing one of my biggest fears with the Indian gentleman sitting next to me who I had just introduced myself to moments earlier. In the second, Keith wanted us to think of something that was holding us back, a behavior that was detrimental to our success but we kept doing anyway (an addiction if you will). My “addiction” came to mind just as easily as my “ultimate goal”: My perfectionsim has fueled an aversion to answering e-mails. I am horrible, horrible, at answering e-mails even though I have the best of intentions. The problem is that when I get a personal e-mail, I want to respond in kind. I want to really sit and write from the heart and be able to edit and re-edit until I get the flow and content just right. But in the end, the e-mail remains unwritten. I know, I know, that my contacts would rather receive something than nothing. And yet, I always find myself in the same situation. So, as of this Monday, which happened to be June 1st, (a nice round date), I vow to hold myself to a higher standard – or maybe to a lower one, as the case may be – and to really make a concious effort to respond to the personal correspondence I receive. I haven’t yet read Who’s Got Your Back (although when I do it’ll be a copy signed by Mr. Ferrazzi himself), but from what I can tell, the next step in Keith Ferrazzi’s plan for happiness is to seek out two to four people who can act as a peer support system or a board of advisors. These are people who must exhibit: vulnerability, candor, generosity and be able to hold you accountable to your goals. So, if I actually go through with this whole thing and you get a call from me asking to be on my “team” I hope you won’t let me forget this promise I’ve made to myself.